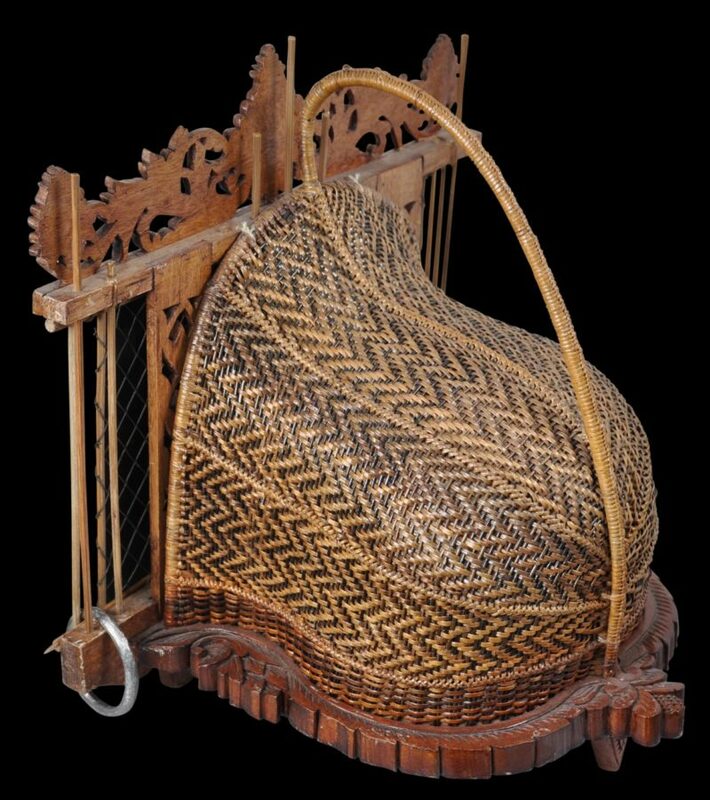 This extraordinary device is typically Malay – it is both utilitarian and highly decorative. It is a trap that was used to catch quails in the jungle and is known as a jebak puyuh. 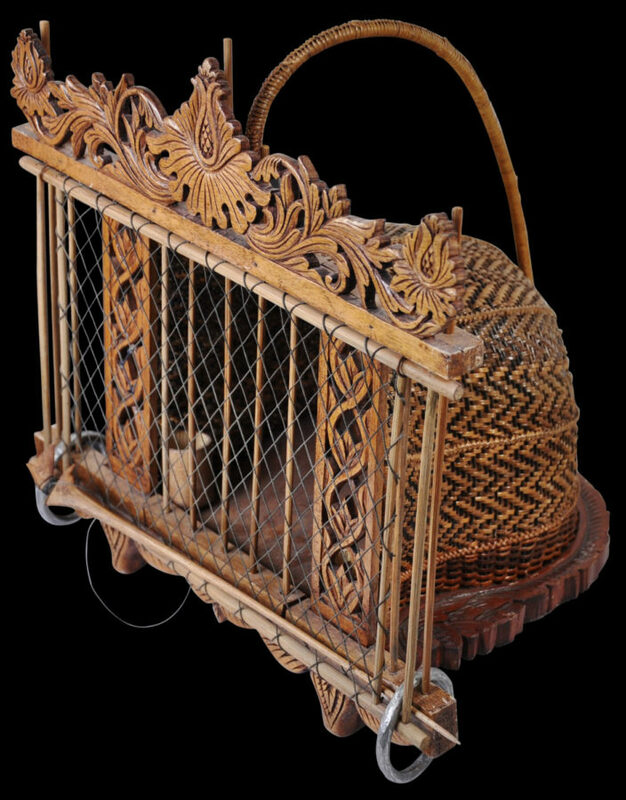 Quail catching was a favourite pastime among Malay princes and aristocrats, hence the development of traps that were excessively decorative such as the example here. 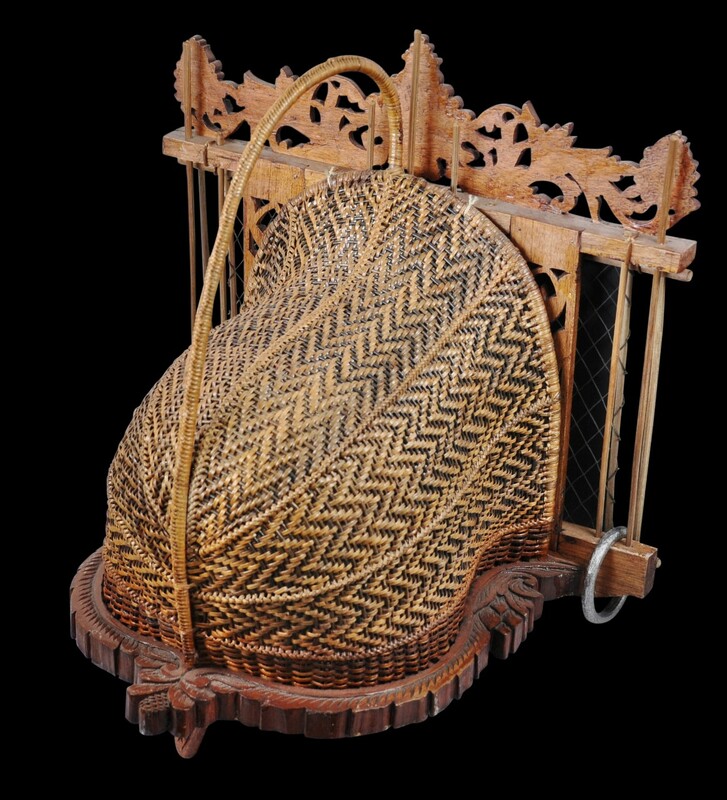 It is a fine example of the relatively sophisticated wood carving abilities of the Malays as well as their basketry. The surrounding carving is most likely made from angsana wood. It is beautifully carved with stylised orchid motifs and the overall form is based on a ceremonial gate or gunungan. 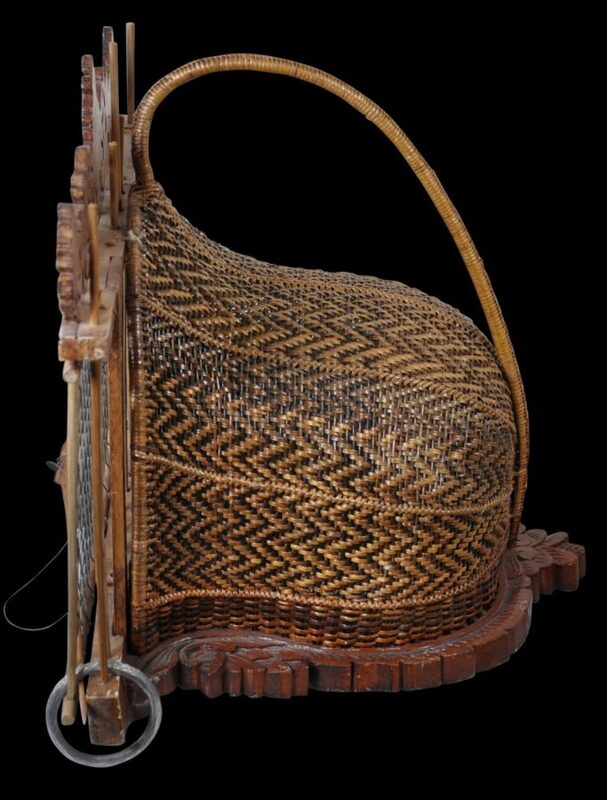 The body is made from neatly and tightly woven fern fronds and strips from the ribu-ribu tree. It works by lifting the front grate of the trap which comprises rattan and woven string. The drop-down bamboo grate behind this is also raised. Inside, a tame female quail would be tethered by its leg. Passing male quails would be attracted inside and as they enter, they trip a stick that holds open the first grate. This comes crashing down trapping the male inside. The owner of the trap can then come and push down the bamboo grate further trapping the quail inside. 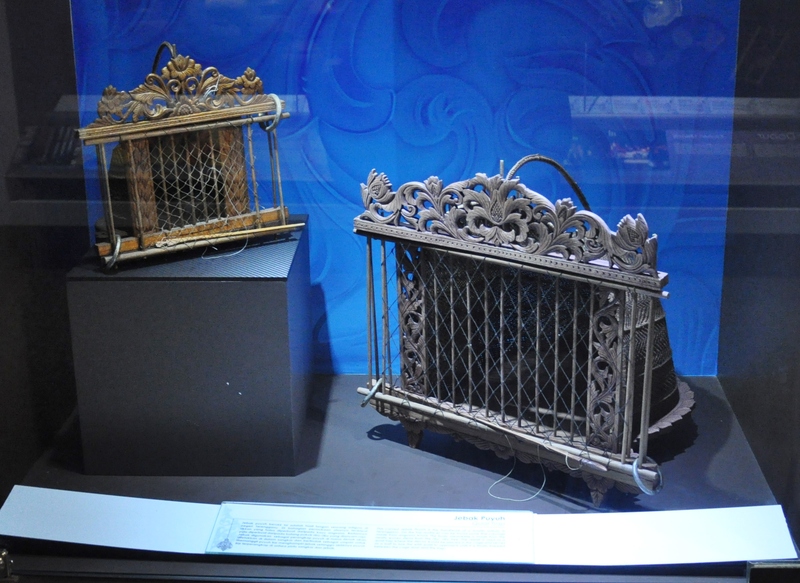 The metal rings on each side can then be looped over the ends of both grates to hold everything secure and then the trap, with the enclosed birds, can then be carried away. A handle to the top of the body of the trap facilitates carrying. There is even a small bamboo canister inside which held water for the comfort of the quails. Noor, F. & E. Khoo (2003, pps. 2, 23. 101, 103) illustrate several related quail traps. 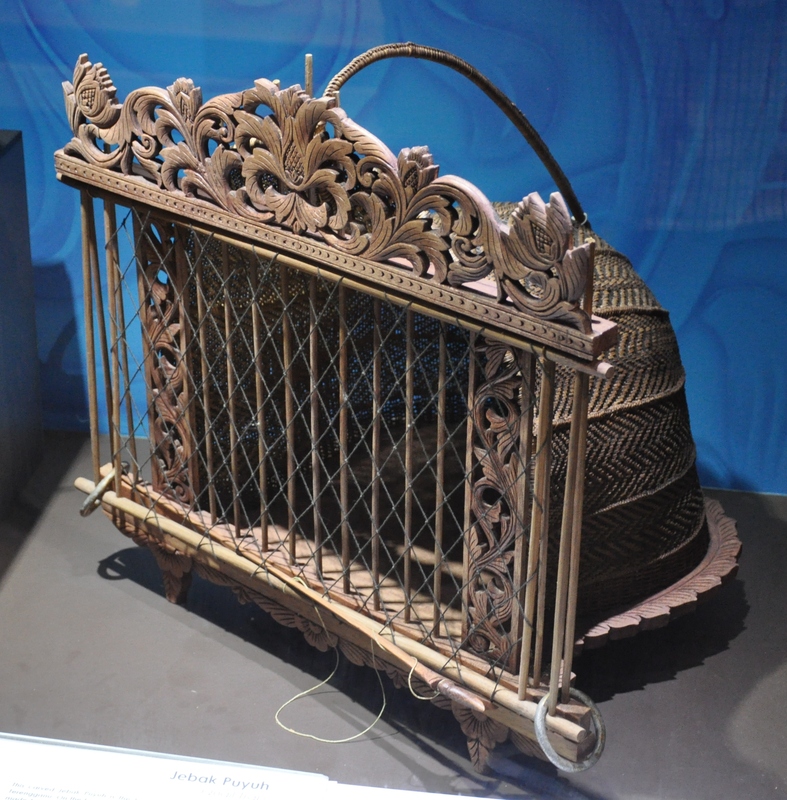 Additionally, Muzium Negara, Malaysia’s national Museum, has several such traps on display. These can be seen in the last photographs.